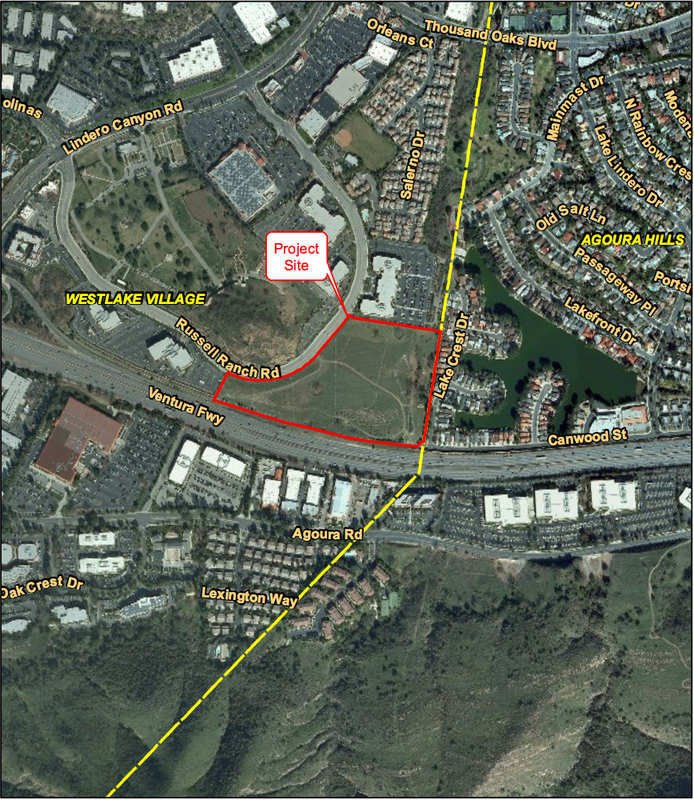 Selleck Development Group, headed by area resident Dan Selleck, is moving forward with a project called “Shoppes at Westlake Village” located on “Lot C” on Russell Ranch Road. This is the property formerly considered by Lowes, and where the Opus office complex was previously approved. The project is approximately 245,000 sq feet (a little more than half of what the previously approved Opus office building complex was going to be … not including the parking structures). The property has a “truck delivery system” reportedly designed to loop around the property specifically to avoid the northern part of Russell Ranch Road (near the Renaissance development). According to Selleck, deliveries will be during designated hours. Starting at $750,000 per year initially, Selleck is projecting $1 million of annual sales tax revenue to the City of Westlake Village after three years and is expected to create 1900 jobs. During construction, Selleck expects 25-75 Average Construction Workers/Month. For traffic, Westlake Village enjoys a high Level of Service (LOS) for almost all intersections all the time. The only time traffic reaches a noticeable level, and only at certain intersections, is during AM and PM peak times (“rush hour”) during the week. The proposed retail development has a much lesser amount of impact on peak times than the previously approved office complex, but adds car trips throughout the day and on the weekend (when there’s much less overall traffic in the City). It also adds during PM peak time, but spread out more evenly than the previously approved office park. As it is currently, other than at peak times, the development is not expected to have a material impact the LOS for intersections, but it will decrease the level of service some in a couple of intersections during peaks. Additional Detail below. Pictures at the bottom. The proposed project would involve the construction and operation of a retail commercial center on a currently vacant, 21.5-acre site on Russell Ranch Road in the City of Westlake Village. The project would include two major retail buildings including associated warehouse space, three retail/restaurant buildings, one retail/restaurant/office building, two restaurant buildings, and one bank building totaling 243,561 square feet. The major retail buildings would be located in the eastern portion of the site. Three one- to two-story retail/restaurant buildings would be located just to the south of the central driveway access to the site. These three buildings would be surrounded by pedestrian gathering spaces centered around an enhanced pedestrian feature, such as a water feature or other artistic feature. Two more one- to two-story retail/restaurant buildings would be located near the southern boundary of the project site, just to the west of the warehouse space across another pedestrian gathering space. 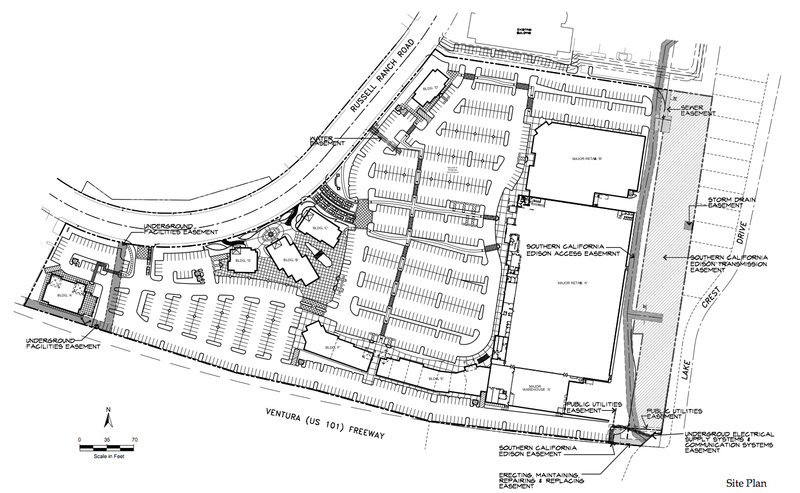 One more one- to two-story restaurant/retail building would be located at the western end of the site, off the sites westernmost driveway access from Russell Ranch Road. Lastly, a bank building would be located at the northwestern corner of the site near the third driveway off Russell Ranch Road. The maximum building height for all proposed structures would be approximately 41 feet, with architectural elements (tower features, for example) ranging up to a maximum of 57 feet in height. 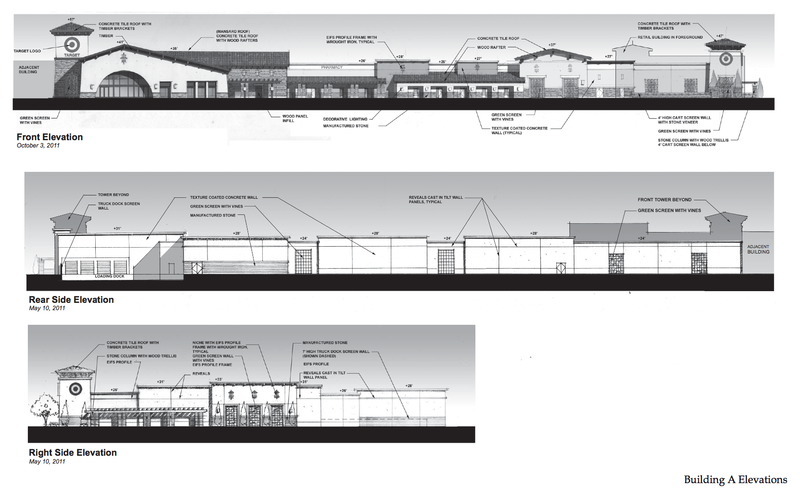 The architecture of the proposed retail center would be a Napa Valley style. The retail buildings would include long covered pedestrian arcades with columns and roof structures. Accent features would break the length of the façade and main entry features. Hard trowel smooth stucco and stone walls, boosted clay tile roofs and large wood cellar doors with wrought iron details would be featured across the building façades. The smaller retail shops would be designed in a traditional storefront style. The buildings would have multiple facades, differing heights, and differing features to accomplish this appearance. These buildings would include greater architectural diversity and color than the major retail buildings in the eastern portion of the site. The project would include integrated, thematic landscaping, consisting of landscaped pedestrian walkways with covered arbors, vines, trees, and ground cover. Hardscape would include interlocking pavers or cobbles combined with stone accents and colored concrete flatwork. Between buildings, defined pedestrian areas would incorporate enhanced hardscape and landscape features, including seating walls, shade trellises, and benches. Assorted landscaping would be located along the projects perimeter. Approximately 39 onsite native oak trees would be removed to accommodate the proposed development. Retaining walls for the project would be located along the eastern portion of the site and along the southern portion of the site parallel to US 101. Along the east portion of the site, the retaining wall would be 21 feet in height at the middle and would drop to eight feet at the northeast portion of the site and to 13 feet at the southeast portion of the site. On the southern portion of the site, the retaining wall would be 16 feet in height on the southeast corner of the site and the height would be reduced moving west toward the middle of the site. The retaining wall would end at the middle of the southern portion of the site. Site access would be provided from Russell Ranch Road along the western project boundary. The site would include three ingress/egress points. The onsite circulation system would consist of a network of drive aisles lined with parking spaces on either side. Pavement patterns would define several pedestrian paths throughout the parking area and lead to paving areas located between and adjacent to surrounding retail buildings. Approximately 1,002 parking spaces would be provided on the project site. Target Store: 136,886 sq. ft.
Shopping Center: 70,575 sq. ft.
Coffee Shop: 1,200 sq. ft.
Quality Restaurant: 10,950 sq. ft.
High Turnover Restaurant: 10,950 sq. ft. Fast-Food Restaurant: 4,000 sq. ft.
– A General Plan Amendment to change the land use designation from Industrial-Business Park to General Commercial, to allow the proposed retail development and use. – A Specific Plan Amendment to allow retail development on the site rather than the business park uses identified in the existing Westlake North Specific Plan. – One or more Planned Development Permits for development of the proposed new structures. – A parcel map to subdivide the site. – An Oak Tree Permit authorizing the potential removal of one or more oak trees. First, some context. Even before Dole, Marriott, the Four Seasons, and the Bank of America office buildings were in place, the busiest portion of Lindero (between 101 and Russell Ranch Road) saw about 50,000 car trips per day. Today, it’s much higher, but mitigated through the extensive upgrades to the “arterial system” (i.e., the on/off-ramps, bridge, and roads). Peak hours, AM and PM, are the times that the system has significant drops in service levels. AM is worse than PM peak. The Selleck project would add about 700 car trips during AM Peak, and less than 1300 during PM peak. Levels of Service (LOS) are calculated for intersections through adopted “Intersection Capacity Utilization” (ICU) methodologies. LOS is indicated by letter, with A being best. All related intersections are currently at a LOS A or B. In the worst case scenario, Lindero Canyon Road/101 NB Off-Ramp is a LOS D, and Lindero Canyon Road/101 SB Off-Ramp is LOS C. AM Peak traffic is worse than PM peak traffic. The City has plans in place for improving the 101 Off-ramp intersections if required. If the project proceeds as planned, Lindero Canyon Road/101 NB Off-Ramp would go during the morning peak traffic hours from LOS D (0.89 vehicle to capacity ratio) to LOS E (0.96 vehicle to capacity ratio). During the PM peak traffic hours, Lindero Canyon Road/101 NB Off-Ramp and Lindero Canyon Rd./Via Colinas would each go from LOS C to D (Via Colinas would go to E when considered with all other expected projects in the area). All other intersections and times would have no impact. All levels, current and projected, have the system within capacity as defined by the City.